With Valentine’s Day right around the corner, I thought it might be helpful to discuss Rose Quartz, also known as the love stone. 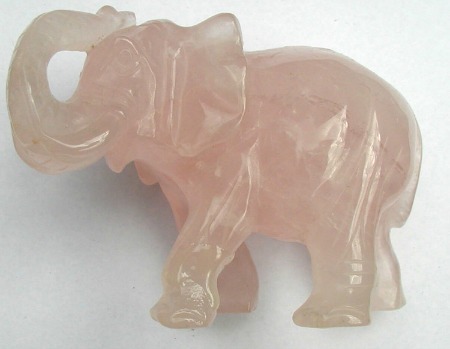 Elephant carved in Rose Quartz. Image in the public domain. This beautiful crystal ranges in color from pale to medium pink and is found in Brazil, Madagascar, India, and the Black Hills area of South Dakota. It’s a 7 on the Mohs scale of hardness (1-10). Geologists tell us Quartz is made up of Silicon and Oxygen; this stone’s pink hues are attributed to either titanium or to dumortierite. According to legend, the god Adonis once was attacked by Ares. When the goddess Aphrodite tried to save him, she scraped herself on a briar bush. It was their mingled blood that turned the white quartz stone to pink. Indeed, sources say Rose Quartz has been used as a love token since 600 B.C. It’s especially adept at attracting new love, strengthening bonds between family and friends, nurturing self-love, and fostering connections within a community. Put some zest into your relationship by keeping a piece of Rose Quartz under your pillow. Wear Rose Quartz jewelry to boost your self-worth. Meditate with Rose Quartz to heal from an emotional breakup. Wash your face in water charged by Rose Quartz to fade wrinkles and beautify your complexion. While Rose Quartz isn’t a traditional birthstone, it’s a natural birthstone for those born in mid-autumn (Oct. 22-Nov. 20) and the zodiac stone for those born under Scorpio. Rose Quartz has long been regarded as a universal antidote to poison. Additionally, it’s useful for lowering blood pressure, balancing the circulatory system, alleviating vertigo, hastening recovery, and supporting most forms of cancer, particularly breast cancer. Healers believe Rose Quartz helps balance the Heart Chakra, teaching us true love and opening our heart to love (both of self and others). The stone clears out anger and jealousy, making way for the healing of heart issues and dis-ease(!) associated with negative emotions. Feng Shui experts recommend placing Rose Quartz in the south area of a home or room to enhance your reputation in the community and within your family. Cleanse your Rose Quartz every two weeks under lukewarm running water. This entry was posted in Sunday's Gem and tagged healing gemstones, Love Stone, properties of Rose Quartz, Rose Quartz. Bookmark the permalink. I wonder if Rose Quartz would work particularly well on someone whose birthstone it is?? I’ve heard of washing with rose water, but I have no experience with that sort of thing. Think I’ll leave that to the scientists and other experts! But if you give it a try, do let me know the results, okay? OUTSTANDING gem post, Debbie! Wow…you taught me a lot. I know of Rose Quartz, but did not know about that legend. How COOL! As you know, green is my favorite color, followed by pink, so I love this gemstone. To me, there is something so calming and soothing about the color of Rose Quartz. I used to use gemstones in my Reiki practice by placing them on their correlating chakra, which would assist in balancing the energy. 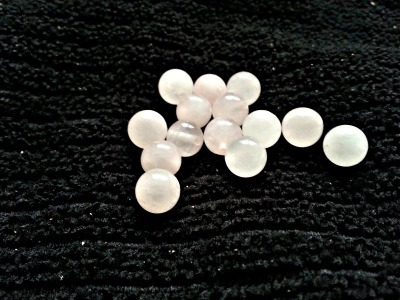 Rose Quartz I would place on the heart chakra. Thanks so much for sharing yet, another interesting and informative post, my friend! Have a terrific Sunday! I hadn’t heard that legend either, Ron, and I’m always glad to pick up tidbits like it. Somehow, it wraps up the whole idea of healing gemstones, by seeing how the notion of certain healing effects came about. Isn’t that delicate pink wonderful? I, too, am a big fan of green, but this color is so soothing. No wonder it’s supposed to work so well on the heart! By the way, do you still do Reiki? I imagine that was most rewarding. I have a big chunk of quartz in my front yard. It came in with the river rock that forms the base for our landscaping. Beautiful post, Debbie. Why, thank you, John. I’ve always liked quartz — the sparkle effect, I guess. Rose Quartz doesn’t glisten like its cousin, but the color is wonderful! How lovely rose quartz is! I did not know the legend about Aphrodite, how romantic that is. I also did not know about diminishing wrinkles, ha ha. I adore your gem post, Debbie. I hope you had a super weekend! Lana, I hadn’t heard that legend either, but it feels apropos for almost-Valentine’s Day, doesn’t it? Glad you enjoyed this one. I was having a great weekend … until the Falcons let the Pats come from behind and take the Super Bowl win! Neither are my team of choice, but I’d cheer for anybody to roust the Patriots, ha!! I think I need this gem. Smiles. I think we ALL could use some, Audrey! Whether for finding true love or easing tensions in our homes or learning to appreciate and love ourselves. So beautiful. Rose quartz. And so versatile in use. Love the elephant. I’m fond of pink and now I’m fond of Rose quartz. Very nice, indeed, Debbie! Thanks, Monica — so glad you liked it! I have a beautiful piece of rose quartz given to me by a Reiki instructor a few years ago that I keep on my writing desk. I do believe it soothes the heart chakra a belief is half the doing, isn’t it? Thanks for all this great research, Debbie. Glad you enjoyed it, Barb. I learned a lot, too!